Unako उनको means "for HER" in Nepalese. The Unako shop sells scarves and bags, handmade in Nepal by women - mothers and neighbours of Her International students. The profits go entirely to fund Her International and its projects in Canada and Nepal. We just launched a line of Unako jewellery, with each bead handcrafted from recycled glass in Nepal. Right now, you can purchase the jewellery in Kelowna at Globally Fair (1695 Burtch Road) or contact us for larger purchases. Glass bottles are crushed into mud molds and put in the wood fire, creating the beads you see below. 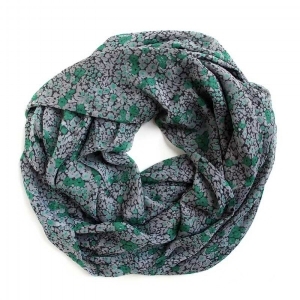 Since its inception, Her International has used scarves as a means of financing. 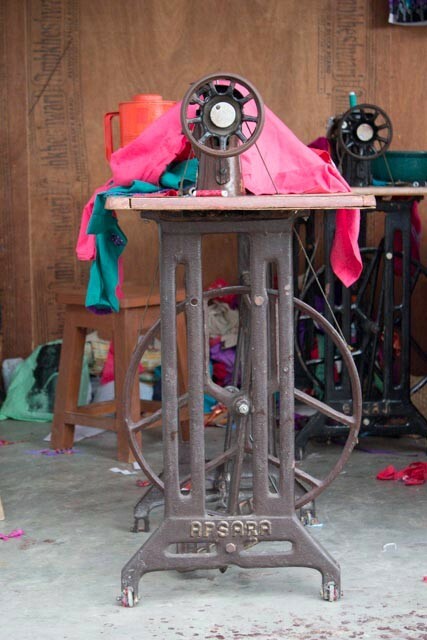 Originally, they came from a shop in the Nepalese capital, but in 2012 Her bought the necessary equipment and formed a group of ethnically Tharu mothers to make and supply the scarves from where our programs are based: in Dang, Nepal. Their creations bear the name Unako "उनको which means "HER" in Nepalese. These mothers of Tharu families whose meager income formerly depended on agricultural work now manage a small sewing workshop. They proudly call themselves "Unako ladies". Not only did they obtain financial independence, but also a sense of dignity that they did not believe was possible. The Unako project forges links between "Unako ladies" and all those who wear their scarves. Imagine: a woman in Canada or the rest of the world wearing a Unako headscarf is actually tied to another woman in a rural area in western Nepal who survives in spite of cruel poverty. Together, we create a sustainable future for those women who now believe in themselves and have hope for their children's lives. Such is the power of a Unako scarf. Wear it proudly, as the impact is enormous. This providential journey began in 2006 when Her's founder, Michelle Bonneau, returned from Nepal with a suitcase full of Nepali scarves to give as gifts. However, those who received them insisted that these would make a fine fund raising strategic for the fledging charity and its small band of educational sponsored students. That was the beginning. Hundreds of women who love the bright colors and softness of the fabrics are now buying Nepali scarves. Good ideas grow. Many of our buyers asked, “Do your Nepali women make these?” Unfortunately our response was, “No” Then finally, in November of 2011, as a group of board volunteers were packing boxes for a scarf fund raiser someone said, “Why not get our Mother’s Groups to make these scarves instead of buying them from Nepali retailers?” Yes, it was a simple enough idea but to start such a venture of course needed funds, which we didn’t have. Previously a teacher with a passion for holistic education, Michelle has created deep bonds with her past students. So, a few former students that Michelle taught 23 years ago, decided to help out. Spearheaded by Lisa Morin and Richard Nadeau from Temiscaming, Quebec, this dedicated group successfully raised all the set up costs for Her International's signature scarf pilot project with Tharu women in Dang, Nepal. Another team of volunteers, located in Montreal and holding expertise in marketing, worked to create a brand identity that reflects the values and passion at the origin of the project. In Dang, the Unako project set up started in August 2012. It was a rainy season and the village was flooded most of that period. Our partner NGO in Nepal, Creating Possibilities, shopped for materials in Kathmandu and found a place in Dang where the mothers could all come work together. It was so hot to work in the local that they had to buy ceiling fans and set it up. The doors were too narrow for the cutting table to get in, so they called in a carpenter and together they took the table apart; brought it in, then again nailed it together. They bought the machines and other equipment in Lamahi (local market in Dang). After the word was out that Her International was setting up a sewing project, the women themselves contacted Deepa and Sarita from Creating Possibilities and wrote their names down. We tried to select the ones who had basic sewing skills but not all had it, rather some were god in needle and fringe making, so we took them in. They all received training from a tailor from Kathmandu who made samples and taught these women how to make the scarves during two days. To our surprise, making the fringes came naturally to the women. The team is now comprised of eight women from three different villages. The first purchase that each of the women made was a bicycle and now half of these women are able to pay for the own daughters education! They now have a regular job to go to rather than wait for some labor work. The group is very supportive of one another, it is a safe place where they share their joys and problems. The Unako initiative supports the women it employs. It supports Her International through its revenue. It supports the community through funding projects that empower women. It supports HER. Carry products on your shelves that empower marginalized women worldwide. We have wholesale prices for larger orders. You can try it out with an order of just 50 scarves, bags, and/or jewellery to sell. Email tamara@herinternational.org.